Mad isn't the kind of guy for a girl, least of all a girl in a yogurt shop. There is something about Hali that he can't seem to get enough of her even though he hasn't even introduced himself to her yet. At the prodding of another customer, he introduces himself changing everything. He next catches her outside scoring a date with his obsession that ends up going well. However, they each have their own secrets which could change everything. I like Mad he's a good guy even if he does live in a world where he does bad things. He had a rough life after all he always thought he was abandoned at an early age, and raised by his adopted mom. He's also carried a secret that makes him different from everyone else. I like Hali she's got her own issues but she also is willing to risk it all for love. 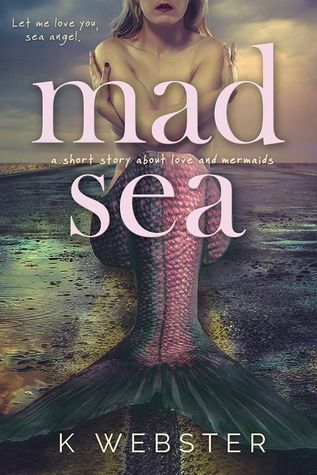 I've had my eye on Mad Sea for a while the cover is calling my name and has been on my to-read list for a while. I always find the mermaid concept captivating and the author has added their own spin creating a unique story. An action packed whirlwind instalove romance of a pair destined to be together they just didn't know it yet. I may not be a huge fan of instalove but it really works for Mad and Hali. I enjoyed the authors writing style it's smooth flowing from start to finish. While we do have alternating perspectives it's easy to tell who's side we are getting and I like being able to connect with both characters. I just wish that the story was a full novel, not a steamy short story. Maybe we will see more from this world, I know I would like to.